Summertime, and the livin’ is easy. Fish are jumpin’ and the cotton is high…I love the summertime, even with the brutal Texas heat. I guess it was about time to get really hot. It’s August after all but you sure can beat the heat with this deliciously refreshing meal. Yes, it’s hot in DFW. For the last 2 weeks the temps were 100, 101, 97, 104, 105, 104, 107, 105, 107, 106, 104, 101, 102, 102. Thankfully, we had 1 day in there that was less than 100 but it is summer, it is August and life is good. We just try not to heat up the house any more than necessary during the dog days of summer and try to eat wonderfully refreshing meals. This is one of those meals. When Baby Lady got off work and came home we made a trip to our local market to figure out what we were having for dinner. 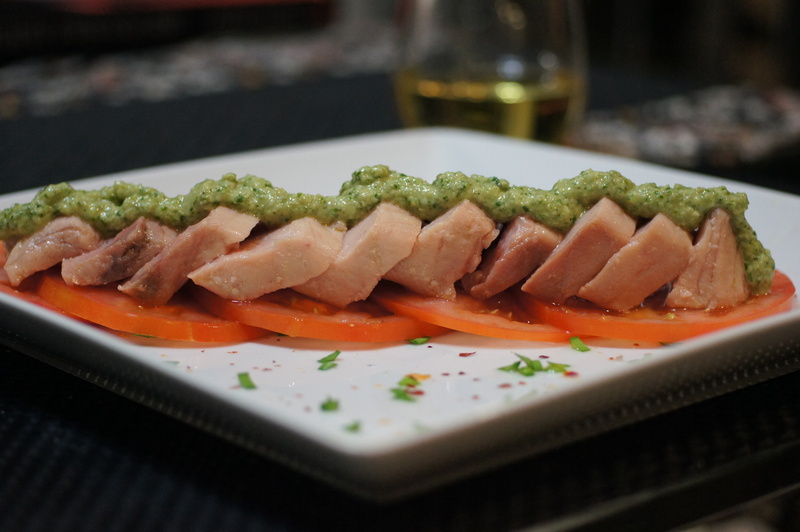 They had some beautiful, fresh Nairagi (Striped Marlin – pronounced na-da-gee) and luscious ripe East Texas tomatoes, which we bought. Now, what were we going to make with it? Baby Lady suggested a nice pesto to go along with the fish. Pesto is such a versatile condiment and we like it a lot. We have fresh basil in the backyard, some walnuts, parmesan cheese and lots of lime so a lime basil pesto, it was. But what were we going to do with the fish. It’s way too hot to grill and we wanted something different anyway. How about poaching the fish at low temperature in olive oil? That would work beautifully and the tomatoes would form the perfect backdrop for this dish. Game on! This is what we did and we sure are glad we did it because this was a fabulous meal. It’s quick, simple, doesn’t heat the house too much and has vibrant, fresh flavors. Oil poaching the fish makes it tender, succulent and flavorful bringing the beauty of the fish forward. You won’t believe how good this is and it’s perfect for a weeknight, summertime meal. 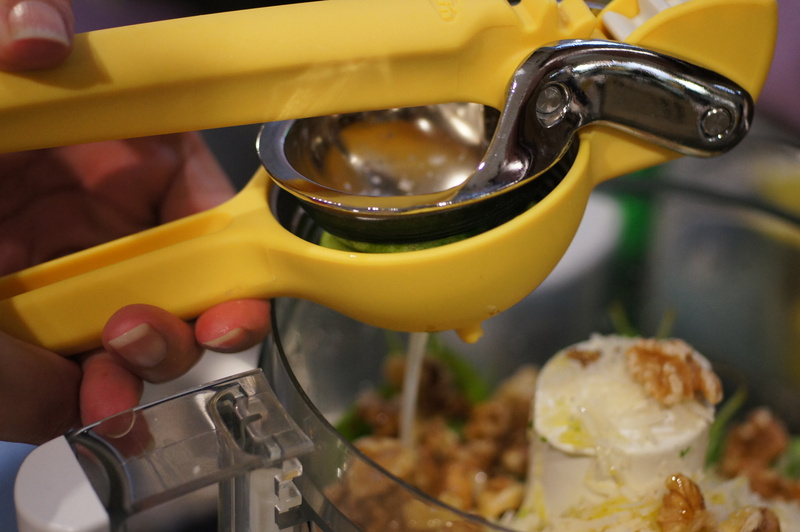 Add the basil, lime juice, lime zest, parmesan cheese, walnuts, salt and pepper to a food processor. Puree and slowly drizzle olive oil into running food processor to incorporate. Set aside. Place each fish in a separate vacuum seal bag with 2/3 cup olive oil. Place in a chamber vacuum sealer and seal with 23 lbs of pressure. Place the bags in a 59 C/138 F water bath and poach for 12 minutes. After 12 minutes, remove fish from bags and place on a rack over a towel to drain. While the fish is draining, slice the tomatoes into 1/4 inch slices. Get a serving plate and sprinkle with chopped chives and crushed red pepper. 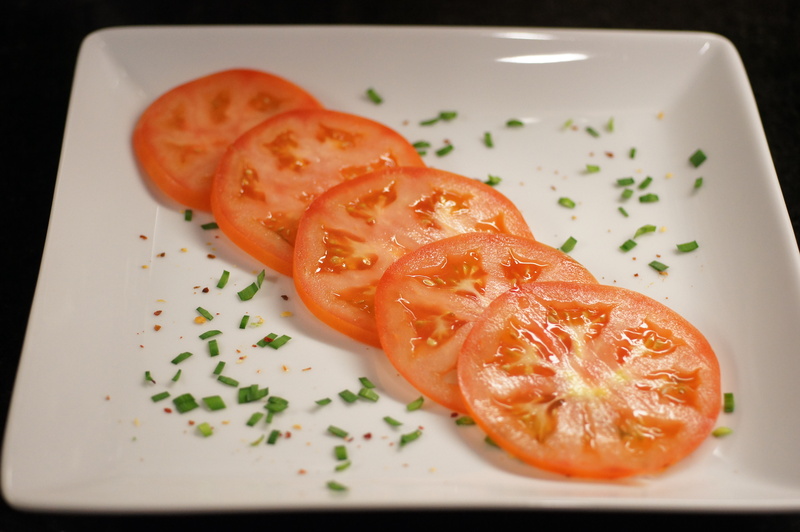 Place tomato slices on plate in a line. Remove the blood meat from the Nairagi. Slice the filets on an angle and place on top of tomato slices. Drizzle a line of pesto on top of the Nairagi slices. Serve & enjoy! NOTES: Now, I poached the Nairagi sous vide because it is so much easier to hold its temperature on a very low setting. You can do this without the sous vide immersion circulator by using a pot large enough to hold the fish filets and covering them with olive oil heated to 140 F. You can maintain the 140 F over very low flame and moving the poaching pot on an off the burner or you can place it in a 185 F preheated oven. Poach the fish for 11 minutes and remove from oil. Thanks for your nice comment. Nairagi is Hawaiian Striped Marlin. It has a dense, meaty flesh. Like swordfish, it is best cooked medium rare to medium and has a steaky texture with a mild flavor. Poaching it made it unbelievably succulent. If you get an opportunity to buy fresh Nairagi you need to give it a try. We love it. 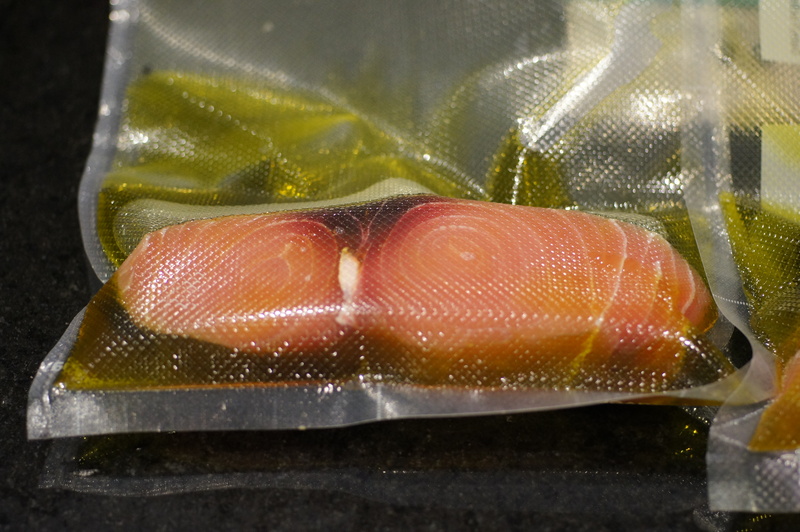 – When vacuum sealing fish with oil, only a few tbsp will coat the fish. So I wonder what the advantage is of using 3/4 cup? The advantage of using a few tbsp would be that it would allow using the best extra virgin oil. – Are you shooting for a core temp of 59C/138F or lower? 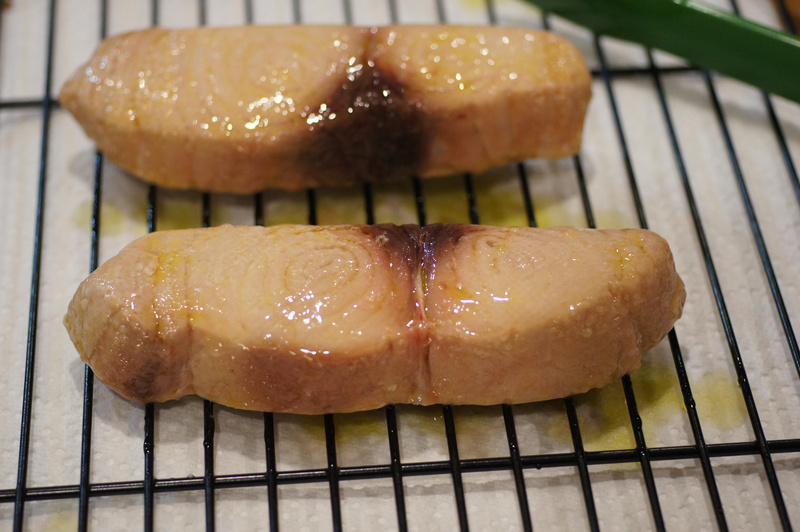 I haven’t tried marlin sous-vide yet, but I expect 50C/122F would be a good core temperature to keep the fish succulent? P.S. Unfortunately marlin is not available fresh overhere, only frozen. I never like the ‘blood meat’ with swordfish (especially if the swordfish is not ver fresh), but you are the first that I’ve seen that removes it. Also in restaurants I always get it with. Perhaps to make it recognizable as swordfish? 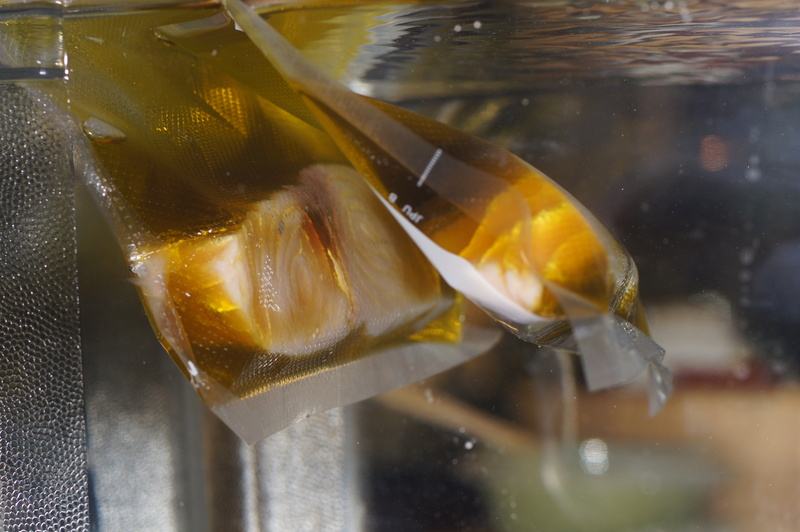 – The reason I used 2/3 cup oil on each fish was because I had read several techniques of poaching fish in oil sous vide. Some suggested 2 – 3 Tbsp oil or butter and others suggested 1/2 cup or more. 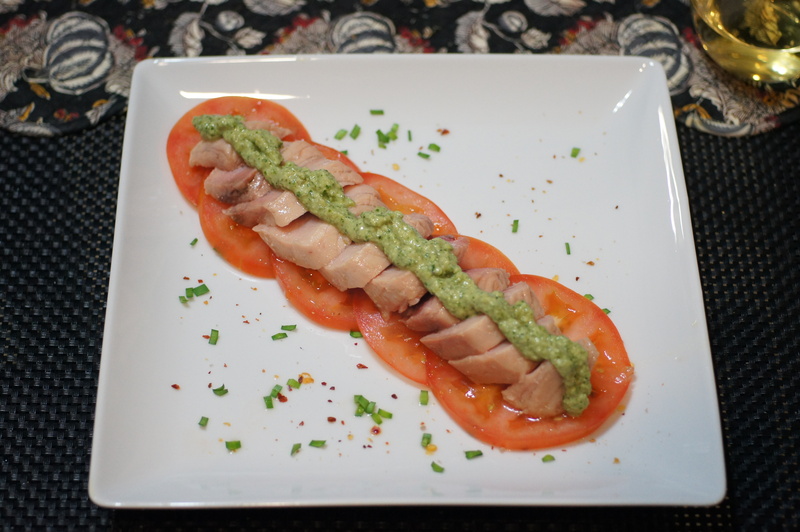 “Under Pressure” by Thomas Keller suggested 40 grams olive oil and 40 grams canola oil for poaching 220 grams tuna. Being safe I opted to follow Keller’s suggestion and 80 grams of oil is roughly 2/3 cup. Next time I do it I will use a different amount of oil just to see if there is any difference. – As for the temperature, any temperature under the local temperature for boiling water is suitable for poaching fish. I chose the temperature and time once again relying upon Thomas Keller. Depending upon the desired doneness, you want an internal temperature ranging from 52C/125F to 54.5C/130F. For this application of the marlin, I wanted a core temperature around 130F which was achieved by the length of time I allowed the fish to poach. Also, given its low cooking temperature there is no danger of the residual heat of the fish raising its core temperature when you allow the fish to drain. As with the oil, I intend to play with the temp to see the differences in the final product. There are a number of people who use 50C/122F. – As for the blood meat, I do not like it at all. It is a very strong flavor which is why I remove it. If I am grilling it, I leave it in when I serve it purely for aesthetic reasons. Who wants a cut up piece of grilled meat? 😉 I also warn people not to eat it as it’s easy for them to see and cut out. On this presentation I was slicing the fish anyway so I removed it. Hi Richard, thanks for your thoughtful comments. Would love to hear the results of using less oil. I am under the impression that Keller’s editor or lawyer may have increased some of the temperatures mentioned in his book for food safety reasons. I have never eaten at his restaurant, but I don’t think he’d serve overcooked fish there. I always cook sous-vide at the desired core temperature, because then timing is not an issue as long as it is within a pretty wide range. This is one of the advantages of sous-vide. Stefan, I have never eaten at his restaurants either although I did unsuccessfully try to get reservations at The French Laundry. He only takes reservations 8 weeks in advance and he is always sold out. So everyone is always making reservations 8 weeks out. It’s wild. I tried for 30 days to get in to no avail and I eventually had to make my plans for the trip to Napa. Oh well. I had not heard the story about anyone changing the temperatures in his book. I know that he was instrumental in establishing the NYC safety guidelines for commercial sous vide cooking and those guidelines are set out in his book. As for core temp, I agree you probably should cook at whatever is the final desired core temp. From what I have read and understand, however, timing is somewhat of a factor because increased exposure to even the correct final serving temp causes the texture of the meat to change. I experienced that somewhat with the porchetta sous vide I did. The pork belly was perfect but the pork loin was somewhat mushy. Very interesting technique again with your sous vide. I’m sure the fish a great.